Just as its name suggests, a comfort bike is comfortable. 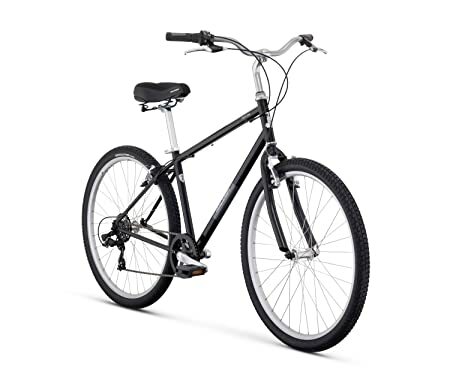 It combines the best of both worlds: street/city/cruiser bike and mountain bike. 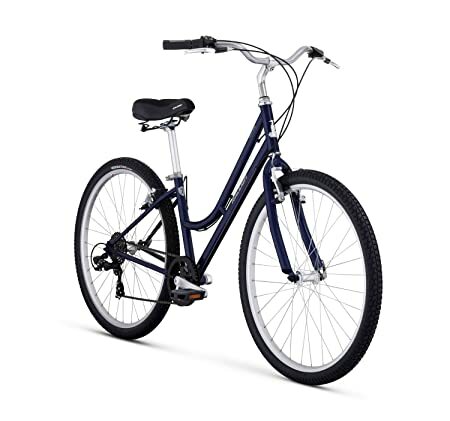 This makes the bike a great choice for folks who need it for casual weekend rides, daily commutes, or outdoor exercises. In this post, we’ve selected the top 10 best comfort bikes so you don’t have to spend hours researching. Let’s check out what they are right below! Which type of shifter would be best for you? Do you need pre-drilled holes to mount a water bottle cage on your comfort bike? Do you need a cargo rack? Do you need a kickstand? 1. What is a comfort bike? 2. Which bike is the most comfortable? 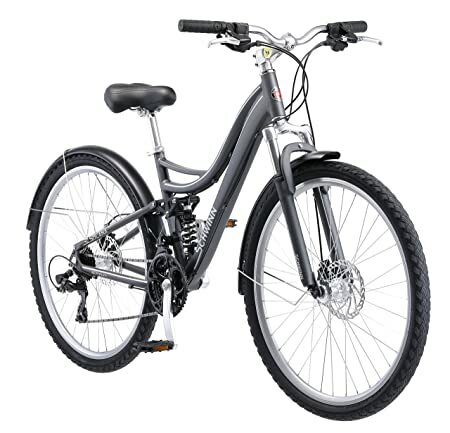 Schwinn High Timber is the #1 best seller in comfort bikes with over 200 happy customer reviews. What we love about this bike is that it looks very sturdy. The frame is well-made from high-quality steel. The welds are done beautifully. Schwinn really nailed every single tiny component of the bike. This is why it makes the #1 spot on our list. The bike’s wheels are quite big: 27.5 inches (700c). The standover height is around 32”. That’s around the waistline of a person over 5’5” tall. Folks from 5’9” to over 6’4 will still find the bike a good fit. What you can do is adjusting the seat up or down a bit to suit your height. High Timber sports a 21-speed Shimano rear derailleur gear. This is badass! Together with its wide tires, this kind of power can take you over all types of terrains. Riding up mountain tops, down hills, over grass, through puddles, or just about anything. The tiny point which we didn’t like much about this bike is that it doesn’t sport a chain guard and fenders. Other than that, this is a solid choice. The champ is here! Compared to the slightly naked High Timber we’ve seen a minute ago, this bike right here looks more like a warrior. He has all the shields and armors, aka the full fenders and cargo rack. In our eyes, this model looks more complete. You won’t find that many spokes in this Discover bike like you’ve seen in the High Timber. That’s why it’s also cleaner to look at. But some folks do like the spider-web-like spokes on High Timber, though. Schwinn is famous for its unique grip shifters on most of their comfort bikes. It works like the throttle on a motorbike, or more simply as the volume knobs on your speakers. The shifters are the grip ends on this bike. To change to a higher and harder gear (e.g. climbing up a mountain), you just twist the grip away from you. To change it to an easier gear (e.g. cruising along a shoreline), just twist the grip toward you. This will become so much simpler after you do it a couple of times. Oh, and we also love the rear cargo rack that ships with this bike. A great bike, overall! Out of all the Schwinn models we’ve seen, this Network bike by far has our favorite spoke design. We don’t even know how to describe it. It just looks so pleasing to the eyes. But, you may be having different thoughts. What’s your favorite up until this point? Unlike the other two models, the Network sports two EZ Fire shifters. This is because some beginners find it a bit hard to twist the whole handlebar end to change gear. As a result, Schwinn has designed this EZ Fire shifter so riders can shift gear with just one finger (i.e. their pointing index finger). Moving right above your brake lever a little bit, you can see a little tail poking out. That’s the shifter. Behind it is an activation lever. It’s kind of like a lock. Whenever you want to activate the shifter, you click the activation lever. It’s there to protect you against accidental shifts. To change gear, you just click the shifter. When you’re happy with the speed, you can deactivate the shifter. Super quick and easy! In a nutshell, this is an awesome bike with all the best Schwinn has got to offer. You can even mount a water bottle cage on the bike in case you get thirsty during your trip. Very handy! This Northwoods Pomona sure reminds us of one of the first comfort bikes our neighbors had. It looks cool with the silver coating and touches of black and blue here and there. We love it that Northwoods is very meticulous with their design. The specs of this buddy are also high. You’ll get a 26-inch aluminum wheelset. Coupled with that are ergonomic steel handlebar and easy-to-use twist shifters. To change gear, just twist the grip like how you twist a towel. It’s also great that they equip the bike with a chain guard. Few bike manufacturers add this to their comfort bikes. So, this is a big plus for the model right here. Tail light is also included, which is very nice. Thanks to the suspension fork and lightweight frame, the Pomona can “swallow” up bumps on the bumpiest roads, leaving you with no hiccups during your trip. Overall, this bike is very good for the price. We’re glad to recommend it to you! Raleigh is another big name in the comfort bike and bike industry. This bike looks super simple and works amazingly well. It’s one of those bikes that your friendly and dog-loving girl next door would ride on her way to the beach with friends. There are 4 sizes to choose from: XS, S, M, and L. The smallest recommended rider’s height is 5’1” and the tallest is 5’10”. Folks over 6’ may find the bike a bit too short and tight especially for their long legs. However, the Step Thru design on this Venture bike is an innovative feature. They make the top tube like a letter J sliding down or the sliders on kids’ playground. This makes getting on and off the bike super easy and pain-free. What we also love about the bike is its Revo twist shifters. It’s not too big, not too small, but just the right size. So, you can just Rev it up and ride! 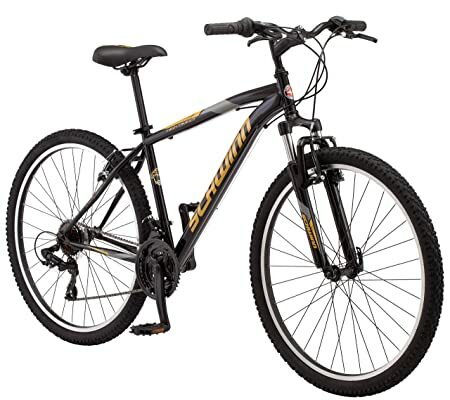 The 27.5-inch wide tires also make riding over bumpy roads or pavements an easy task. You’ll glide over them like butter. Assembling this buddy may take around 30-120 minutes depending on your skills. If you’re unsure, get some professional help or read their instructions. Raleigh really stands behind their bike quality and craftsmanship. So, you can take your Venture out for your next adventures! 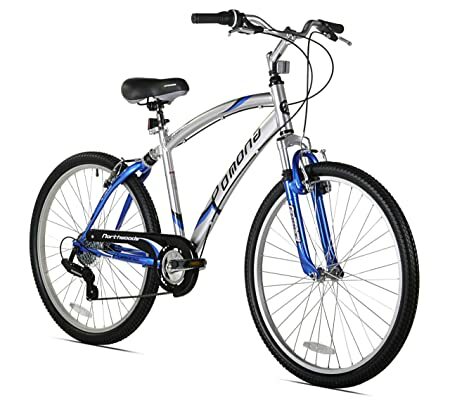 This Schwinn Solana is great for ladies who have an active and healthy lifestyle. The sound and look of it give us the vibe of a nice romantic song. Just like Frank Sinatra serenading us to the moon. But, okay, we should get back to Earth now. This model, once again, shows how thoughtful Schwinn is when designing bikes for their riders. Why? The shifters they use on this Solana is Micro thumb shifters. Now, we understand that ladies may have smaller hands and shorter fingers than men. Which is why the EZ Fire shifter may not be a good fit because ladies may not be able to reach the shifters comfortably. Grip shifters may work, but some petite girls might not be able to grab a full hold of the grip. All of this leads to the invention of the Micro thumb. Small women can easily change gear using their thumb. Plus, the lever is micro-sized and very easy to click. Really appreciate this, Schwinn! What we think many riders will love about this bike is that it’s made from high-quality and lightweight aluminum. A very tiny point we didn’t like, however, is there are no pre-drilled holes on the bike to mount a water bottle cage. Schwinn should definitely take note and improve this feature. Other than that, a beautiful bike for all of the amazing ladies out there. Can we just say: This Raleigh Venture 3.0 is so beautiful! It looks like a masterpiece that’s so unique and different from the rest of the models. And this right here has got some seriously heavy duty Hercules power. It can take riders over 300 lbs like it’s just styrofoam-light. Considering the bike is only a little over 30 lbs, this is 10x their body weight. Amazing support! 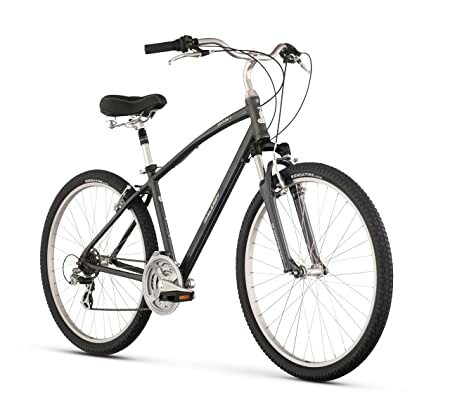 You’ll get 21 speeds with this bike thanks to the 3 front & 7 rear gears. Its body frame is made from top-grade aluminum with True Comfort geometry. Also, you’ll get a front and rear brake that’s so easy to use thanks to Promax alloy V-brake system. You can also mount 2 water bottles onto the bike. That’s double the power! So cool! The seat is plush like a little mattress contouring your bottom area comfortably. Plus, the crankset is made by Prowheel which will surely stand the test of time. Overall, this Venture 3.0 has some really high specs and power. It’s waiting for you, the adventurous and fun-loving rider, to take it home and have great adventures with it! To make a long story short, this Venture model has all of the features and functionalities the Venture Step Thru model has, except for its top tube design. This Venture follows the traditional geometry many bike manufacturers use for their comfort bike: The horizontal top tube (crossbar) that completes the front triangle in the frame. We just love the black finish on this bike. It’s not matte, but it’s a little bit polished. It’s not too polished that’s over-the-top glossy. It’s just right. The bike ships 85% assembled. So, this may sound like bad news for folks who are clumsy with their hands. On the other hand, this is going to be a fun project for handy folks. Either way, you’ll find the instructions super easy to follow. Some folks built the bike in under 15 minutes! Like the Venture Step Thru, this is a 7-speed bike. You’ll get 1 front gear and 7 rear gears. Shifting gear is also fast and easy with the Shimano Revo twist shifters. 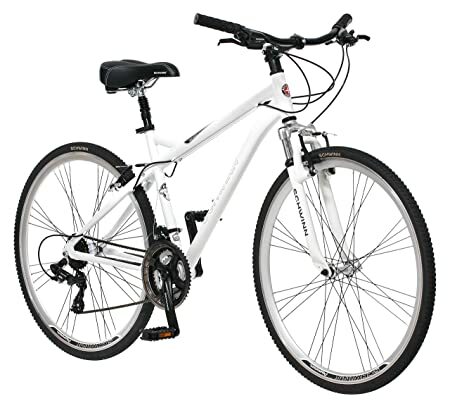 This is also the lightest model out of the Venture series Raleigh releases. You’ll get 1 water bottle mount right on the bike. Super convenient! All in all, if you like a less curvy design and a somewhat more sturdy look, this is the chosen one for you. We give it 5 stars and highly recommend the model! Does the Wildwood’s green color remind you of anything? Personally, we were reminded of that Japanese seaweed (if you’ve ever seen them). For others, this is like the iconic green on Monster energy drink. We love this bike because its stem is adjustable. You can change its height and angle easily to suit your height. The handlebar is flat, allowing you to ride in a natural, comfortable, and upright position. The Kind Shock seatpost works in tandem with the HL Zoom suspension fork to smooth out any bumps on your way to the destination. There are 3 gears at the front and 7 gears at the rear, giving you a total of 21 different speeds to choose from. The drivetrain of the bike uses Shimano Tourney mechanism. This system is very reliable and provides crisp shifting every time. You can choose from 4 sizes: S, M, L, and XL. Although the Large size fits folks up to 6’1”, some folks as tall as 6’2” find the size just right for them. Because the bike arrives 95% assembled, you only need 30-60 minutes to complete all the remaining parts. Be sure to check if there are any missing parts in the package, though. Other than that, this is a well-rounded bike for the price. You can count on it for years. Some folks had to order a second one because bike thieves couldn’t resist getting their hands on this baby. So, lock your bike carefully! If 21 speeds are still too limiting for you, check out this 24-speed Vilano bike. Unlike the other models we’ve seen, this Vilano sports a disc brake system. Mechanical disc brakes are very powerful. With such power, you’ll be able to stop your bike easily even in wet and rainy conditions. The overall bike is not heavy at all. 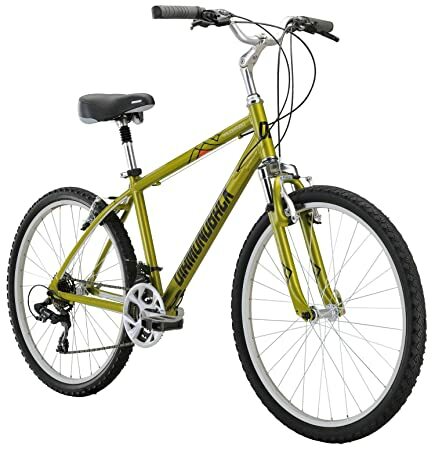 The frame and fork are made from aircraft-grade 6061 aluminum. This is a super durable, strong, and lightweight material. They use the Shimano EF51 ⅜ speed shifters on this one. Remember the EZ Fire shifters on Schwinn bikes? The shifters here are exactly the same. You adjust the speed by pulling the shift lever backward with your index finger. As a bonus, Vilano included 2 free pedals with every bike. Also, they pre-drilled some holes on the bike for you to mount your water bottle cage. Very thoughtful of them! The tires on this baby measure 700 x 35 mm. These are good specs, meaning, you’ll get some big fat tires that can smooth out any bumpy spots. There’s no kickstand that ships with the bike, however. So, you may want to add that. Overall, this is a great bike with an awesome performance. Some bike lovers call this the Bitchen Baby. Because you’re looking for a comfort multiple speed bikes, you’d want to care about the shifter. Are they easy to use? Can my fingers reach them comfortably every time? Obviously, there are many other kinds. We recommend the micro thumb shifter for women, especially those with more petite body type. Trigger shifter, in general, could be easier to control for beginners. Because some folks find it hard to maintain balance while twisting the grip to change gear. The twist grip shifter would be perfect if you’re more comfortable with riding overall. It would be a pain for you if you have to manually drill holes on the bike to hook your water bottle cage on. Some sellers have these type of Velcro tape adhesive hooks as holder. But these tend not to have a good grip onto the bike frame. They may drop down, especially when you’re riding over bumpy obstacles. And carrying a water bottle on yourself is out of the question. So, choosing a comfort bike with pre-drilled holes right from the beginning will save you a lot of time and hassle down the road. Some models like the Schwinn Solana, unfortunately, doesn’t have this feature. Other models like Schwinn Network 3.0, Raleigh Venture, Raleigh Venture 3.0, and Vilano have 1-2 places for your water carrying need. If you don’t need a rear cargo rack, you can skip this part. 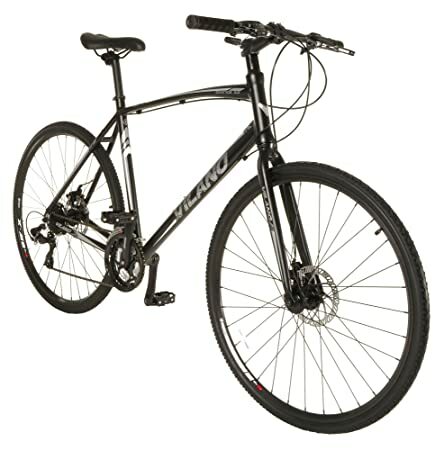 But, if you do, check out the Schwinn Discover 700c bike. It’s one of a few comfort bikes we could find that ships with a rear cargo rack. This extra accessory is proven to be very useful, especially for carrying items like a backpack, groceries, and other things that you may need along the way. If you want a kickstand, you can forget about getting a comfort bike. Because no comfort bikes on the market have this little piece. If you like one, you can head over to our review of the best cruiser bikes. Now, the reason why they don’t add a kickstand on comfort bikes is simply that riders don’t need it. A comfort bike is a slight variation of a mountain bike. And on a mountain bike, there is no kickstand. They remove this piece for a couple of more reasons. It may be dangerous for the rider when they crash. Plus, it adds weight and may damage the frame by shifting the weight and balance over to one side for a long time. Also, it’s somewhat inconvenient when riders have to kick the stand up and down every time they need to use their bike. Some are just fine laying the bike on the ground or against the wall. Still, if you want one, you can easily get one and hook it onto your bike. It costs less than $20. A comfort bike is a more comfy variation of a mountain bike. 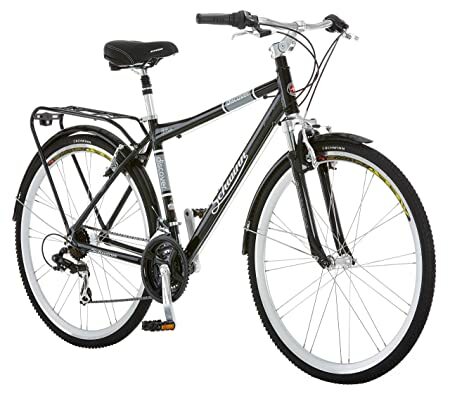 It’s originally designed for casual short distance jaunts on bike paths or any flat terrains. Some comfort bikes are equipped with derailleur gears while others have hub gears. A lot of hybrid comfort bike models nowadays can even take you up hills, down hills, and over other rough terrains very easily. You can use these bikes for daily commutes, outdoor exercises, or weekend cruising. We’d go with the Schwinn series (High Timber, Discover, Network), Raleigh Venture series and Vilano. If you’re a bit heavier or taller, you can check out DiamondBack bike. Northwood is also a very good option.